Cup Characteristics: Very aromatic with w a fruity tending floral flavor. Luxury Organic Ingredients: Camomile flowers. Camomile can be made into a pleasant aromatic tea which is slightly bitter but with a fruity flavor. It is often sipped for relief of health problems ranging from toothache to nervousness. 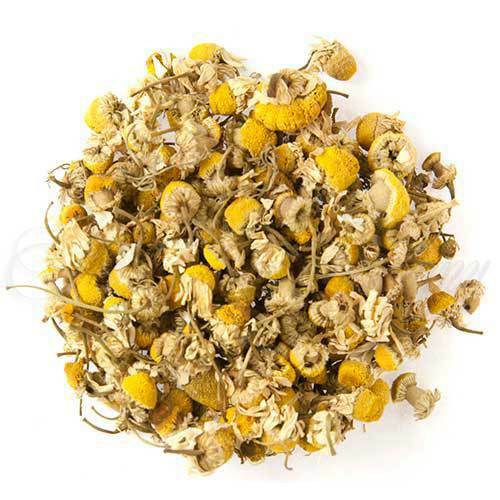 Camomile has also been noted as beneficial for soothing headaches and is a natural relaxing herb known to assist the restless and those suffering from insomnia. In many circles Camomile is called nighty night tea or sleepy tea on account of its natural properties, which promote restfulness and drowsiness. It is also known to assist digestive disorders by settling the stomach and calming the nerves. The plant’s botanical name Matricaria, is derived from the Latin term for womb because it was once used as an herb to treat female troubles. Camomile is derived from ancient Greek and translates as “Ground Apple” in reference to the fruity aroma. Like many teas and herbs camomile should be consumed without the addition of milk.